The Erie SeaWolves have been no stranger to the national spotlight. This past summer, the Erie SeaWolves went viral with their “Sugar Rush Night” creation – a hot dog wrapped in a cotton candy bun and covered with Nerds candies. Last fall, the Erie SeaWolves named the Eastern League’s Larry MacPhail Award nominee as they were recognized as the top promotional team in the league in 2017. 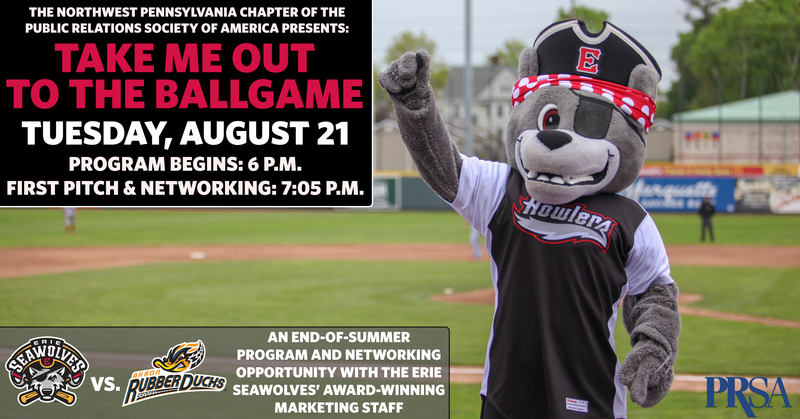 The SeaWolves will discuss their team’s communications and marketing strategies, including their Home Run Recipes Campaign, which won both a SILVER and GOLD Niagara Award this past year. They will also discuss their Alternative Facts Night and how they managed the national buzz surrounding their Cotton Candy Hot Dog as part of a special pre-game presentation. “Pitching a Homerun Campaign” takes place Tuesday, August 21 at UPMC Park prior to the SeaWolves game against the Akron RubberDucks. This presentation is sponsored by the Northwestern Pennsylvania Chapter of the Public Relations Society of America (PRSA). Following the presentation, registrants will enjoy an opportunity to network with PR/communications, digital media and social media professionals. The Erie SeaWolves are the Double-A Affiliate of the Detroit Tigers and play in the 12-team Eastern League which spans as far west as Akron, Ohio, as far north as Portland, Maine and as far south as Richmond, Virginia. Cost to attend the event is $15 for PRSA members or students and $25 each for non-members. Tickets include the presentation, a ticket to game and a drink token. Those who wish to attend the presentation only may do so for $5 members / $10 non-members. Attendees can register for the presentation by filling out this form. The Northwestern Pennsylvania Chapter of the Public Relations Society of America (PRSA) is the professional organization that brings together public relations, communications and marketing practitioners throughout Erie, PA. Each November, they honor the best in public relations with their annual Niagara Awards. If you have any questions about the event, contact Marissa Orbanek at marissaorbanek@generalmclane.org.